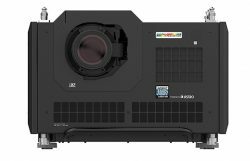 Set to be the world’s first commercially available DLP® laser 8K projector, the INSIGHT Dual Laser 8K sits in a class of its own when it comes to performance. Providing an ultra-high 8K resolution (7680 X 4320) of 33-million pixels through 25,000 ANSI lumens of solid-state laser-phosphor illumination, the new flagship projector is the ultimate solution for the most elaborate medical, scientific and immersive visualisation and large-venue applications. In addition to the resolution and lumen performance, it uses proven DLP technology incorporating 3x 1.38" DarkChip™ DMD™ chips and Digital Projection’s ColorMax™ technology to ensure superb colour accuracy and black levels. These are especially vital imaging characteristics when matching projectors in tiled or blended applications.